You are a great master builder in the Middle Ages. You employ master craftsmen, foremen, tradesmen and apprentices. You bid on building contracts and with your workforce construct buildings. Upon completing each building you receive money so you can pay wages and possibly take on extra workers. Unforeseen events such as town fairs, fires and higher wages in other cities can make managing your projects very difficult. Also, not all workers are as committed to their jobs as others and some may just not show up for work simply because they were out late the evening before. All this could result in you having to deal with higher costs, late completions of your building projects or the need to dismiss workers. In the course of the game beautiful buildings will be created and at the end a medieval city will stand in the middle of the table — complete with city walls, fortified towers, city gates, houses and a town hall. 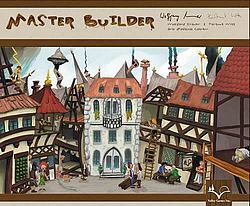 Your aim is to become the greatest and most famous master builder of the Middle Ages. Of course, your opponents will have the same aim so a lively contest will develop for supremacy in the building trade. The winner will be the player who has the most money at the end of the game.